Latest hair loss news covering lasers for hair loss and lasercombs. Capillus, LLC announces plans to expand laser therapy cap distribution and physician network in Europe and Asia. The Miami-based medical device manufacturer and marketing company has appointed Fernando Bermúdez, former Business Development Director of Svenson Group Europe, as Division Director. An industry veteran, Mr. Bermúdez’s professional achievements include increasing the number of Svenson centers by 75% in Spain, while also penetrating the Portuguese marketplace with centers in Lisbon and Porto. 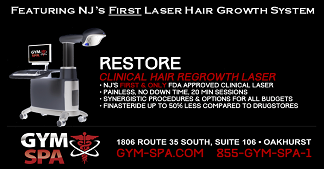 Long-awaited Laser Hair Regrowth System Now Available in New Jersey for the First Time. Beyond the obvious aesthetic effects, hair loss is associated with adverse psychological effects including anxiety, depression, and poor self-esteem. Laser Hair Regrowth is the biggest advancement in non-surgical hair loss treatment in decades. Clinically proven to regrow hair, laser treatment is especially innovative for women since female sufferers have historically lacked effective remedies.